Satellite altimetry data have been used to study water circulation in the Tatar Strait region (the northern part of the Sea of Japan) for the time period from 1993 to 2015. 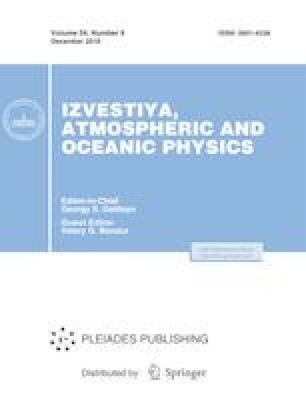 Seasonal and interannual variations in current velocities in the southern Tatar Strait (46°–50° N) have been found to be determined by the difference in sea level (SL) between the Korea Strait in the southern part of the Sea of Japan (Hakata station) and the northern point of the Hokkaido Island (Wakkanai station) (SLHakata–SLWakkanai). With increases in (SLHakata–SLWakkanai), the flow of the Tsushima Current into the Tatar Strait increases, the southward flow of the Primorye Current along the western boundary of the Tartar Strait decreases, and the southward flow of the West Sakhalin Current along the eastern boundary of the Tartar Strait increases. The decreased (SLHakata–SLWakkanai) leads to the formation of cyclonic water circulation in the Tatar Strait, a change in direction of the West Sakhalin Current from southward to northward, and an increase in the southwestward water transport by the Primorye Current. An increase in (SLHakata–SLWakkanai) accompanied by increased water flow through the Korea Strait leads to an increase in seawater temperatures in the northern part of the Sea of Japan. This study was supported by the Russian Science Foundation, project no. 16-17-10025.